In december 2016 Socios Sports launched Software as a Service (SaaS) platform www.contentstadium.com to help sports teams and organisations to create and publish premium branded visuals and GIF’s within seconds to their social media pages. Realtime stats and odds are being integrated with only one click to support the realtime coverage of sporting events. Since December we’ve seen that reach and engagement of the social media content of clients using Content Stadium (CS) increased with an average of 20%. With CS editorial teams have been able to create more visual content and saved a lot of time and money. Amongst the current 30+ existing clients are a.o. PSV Eindhoven, FC Utrecht, the Royal Dutch Football Association (KNVB), de Telegraaf (#1 newspaper in Netherlands), Eleven Sports Network (sports broadcaster Belgium) and Ziggo Sports (Dutch #1 sports broadcaster). 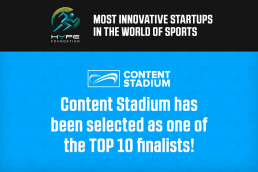 Recently CS was selected in the Top50 of the HYPE most innovative companies in the world of sports 2017 and even made it to the Top10 that had to compete in Cardiff during the SPIN finals alongside the Champions League final in Cardiff. Although CS didn’t end first, we’re very proud of the recognition the platform got due to this event and are looking forward to further internationalizing the platform within the coming months.